(FORT BEND) – Texas State Technical College Diesel Equipment Technology student Troy Ketchum will be graduating in the coming months, but not before travelling to Louisville, Kentucky as the first student from TSTC in Fort Bend County to compete at the 54th annual SkillsUSA National Leadership and Skills Conference. At the end of the month, the Rosenberg native will compete against thousands of other students from across the United States in hopes of bringing home a gold medal in his category: Job Skills Presentation. TSTC in Fort Bend County Provost Randy Wooten said that the entire college benefits from having students like Ketchum compete in these events. Wooten also said that he has been involved in Ketchum’s dry-run presentations and practices since before the state competition and he knew immediately that he would be hard to beat. The United States Navy veteran has been preparing his presentation, “The Importance of Proper Tread Depth and Safety of Truck Tires,” and his delivery non-stop for this competition. Ketchum has taken two days out of the week since the beginning of the year to present in front of students, faculty and staff at the campus. Spencer Paige, lead instructor for Diesel Equipment Technology and SkillsUSA advisor, said Ketchum has told him that he even practices while driving, at work and at home in front his brother or a mirror. 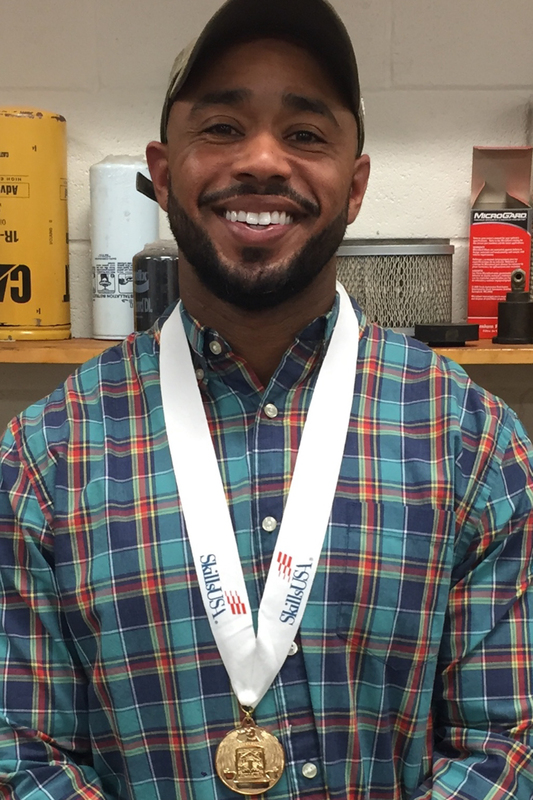 “He has put in so much work and effort into SkillsUSA. We are proud him,” said Paige. “We are positive that he will do well and represent TSTC positively. Ketchum, who is also looking forward to graduating in August said that the skills he has learned in class and by competing in SkillsUSA have prepared him for a job in his field and for what he calls a leap from waiting tables full time. Ketchum and at least 50 other TSTC students statewide will be competing at the week-long event, June 25-29. This entry was posted in Fort Bend County on June 16, 2018 by Amanda Sotelo Sotelo.